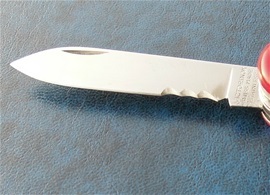 On sakhome.com I have discussed that where the serrations are placed on the blade can influence the philosophy of use. Serrations or waves are excellent for cutting rope, webbing and belts. Serrated edges can like a plain edge knife have different edge angles for cutting tasks and depending on blade thickness and steel. Waves or serrations can also be adjusted in more than the edge angle. They can have variations in depth and width + the angle can be tilted forward on the blade. In other words instead of a 90 degree you can use a 50 degree angle for serrations. Without a doubt different designs on them can influence the cutting abilities and make it cut materials with less saw motion. "Follow the shapes on the already created edges"
In the hand the blade with cut sections that can be waves and serrations will have different angles depending on how the handle design is. These edges will be more durable and require less sharpening between maintenance. Today it is possible to use a single tapered sharpening rod for most serrated edges. That said I will show one system that I recently got. 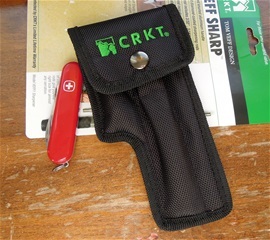 It is designed by Tom Veff for CRKT for the sharpening of Veff serrations. Not only is this a genius system it will make it possible to do a lot more than just sharpening the Veff serrations. It got a 600 grit surface that is perfect for most sharpening tasks today. It can be used for leather punches, most types of serrations, plain edges, fish hooks, chain-saws, scissors and garden tools. With a file or by using the imagination you can make similar serrations with materials you can get most places. What I like with this design is that it is a durable, strong and well thought through product that allows you to experiment with edges and designs. It is possible to created serrations that are wavy or adjusted with different designs for the cutting abilities. I do prefer when sharpening plain edge knives that the width of the flat sharpening section is greater. That said this is a complete system and it can be brought along to be used for practically everything in the outdoors or at home to put it so. Because this system is made in metal, with the diamond 600 grit surface you get much control and the handle increase the safety and control. It is a complete system. There are set sections on the rods for the different size of the serrations. It is a not like the types that is gradually becoming thicker towards the handle. On this it is set by different sections and by doing so you will get a better precision on the edges. By using diamond stones like this you use very light pressure to light pressure pretty much always when you are sharpening. This is the clue for most types of sharpening systems and devices that you use little pressure. The advantage with diamond coated stones is that you can use them dry and that you can use them in all directions. When you use fine water paper around a round device the paper can be cut. You use it in one direction to avoid cutting the paper. Tom Veff experiments, invents and make serrations with abilities that are better cutters. The design on the Victorinox wavy edges are designed for several materials. I have noticed over the years that serrated edges can snag or get stuck into the material you cut. One of the ideas with such edges is to cut difficult materials that a plain edge would get trouble with. In most cases the waves will cut, rip and be used in a sawing motion. With the Veff serration you get more intelligent cutting abilities on rope, webbing and belt without so many snags. It is very interesting in deed. For sure i will do some experimenting to learn more. By using different patterns on them it is possible that you can use one of the more distinct serrations to cut a single material alone. It is like a hooked belt cutter edge that cuts. Or they can work together as a total for larger materials. It is cool! From experience i learned that larger tools saves time and they require less sharpening between maintenance. For sure it looks like larger/wider serrations also save time. When you are sharpening the serrated or wavy edges it is smart to find the size that fit the already made edges and to follow them. By doing so you can continue to have the abilities it is made for. It is not so that you can take the normal wavy edges and change them. By this i mean to create new shapes or designs on them. 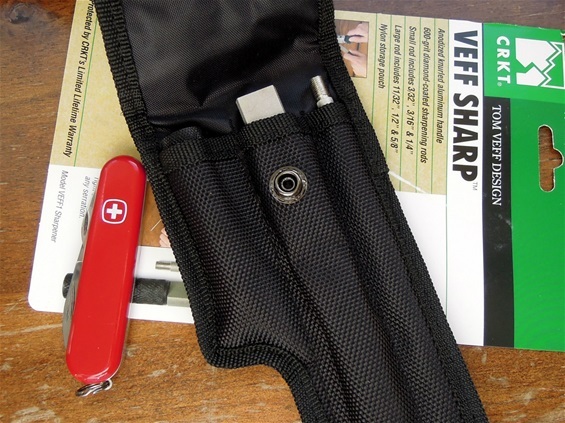 With the Veff sharp it is no problem finding the size for the traditional waves. With the Veff sharp you can experiment and take a plain edge knife and create the design you like or what fit your philosophy the best. So far i have not used it much yet. I know it is very good without any doubts. It worked very well on the wavy edge. I had it recommended to me and it will be used. To make different edges in a production require extra steps. In some cases there are used grinding wheels with the set design for them. How Victorinox and Wenger made their designs i am not completely sure about. In a modern production the waves and or combination edges are made together in the process. In some productions it could be that each wave or serration is individually cut. Special purpose designs can be extra demanding for a production. I have sharpened by hand for many years and i like it very much. From experience i have learned how different patterns on the edges can create different abilities. If i should have a rope tangled or a belt that is stuck i would not care about how the pattern rips and splintering with cords all over the place. If you are doing rope work then there are different factors involved. A clean cut for rope will make it easier to continue working and require less work to prevent further splintering. Mr.Tom Veff speaks about this and it is very interesting and i have experienced this myself. It is also so that some patterns will in an emergency require less effort or force to cut. Another factor is the strength of the patterns and edges. It is possible to create stronger patterns that also cut better with less effort. 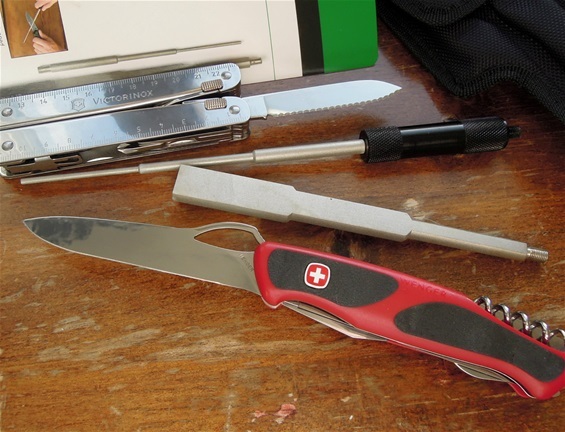 The pattern used by Victorinox and Wenger are very useful and durable. They have cut any material i have tested. They are made to be an "all use pattern" By this i mean on materials like belts, webbing, rope and similar materials in general. They can splinter the materials it is used on. To avoid this you can use the plain edge for a cleaner cut if it is possible. I have wanted to put some serrations on a plain edge 91mm Victorinox blade. Not completely like the Veff serrations. I made it rather similar and used a wide design pattern on them. Used round metal files first and then the large rod middle section for the serrations. My intention with the design was to put them on the inner section of the blade with the philosophy that they will first capture the materials I cut. In reverse holding and pulling the material will be forced towards the plain edge and be cut. It actually worked and it is very sharp. In other words it is now a combination blade. The serrations did cut the large material and when I pulled it went through like nothing. With the design I made the pattern closer towards the spine in total. I did not want to have the tips of the pattern in the same level as the plain edge. It worked because it traps rope and can cut it alone or in combination. The blade for this was ued for some time before the pattern was put on and it was fun to experiment. For sure people done this before i believe. It is now a modified knife and modified serrations. I learned from this that next time i will put on an even sharper angle of the pattern that will make them even sharper to cut. Wavy edge has been used on traditional Officer knives for a very long time. It is actually difficult to set a firm date on them. Because the 91mm is a slip joint construction makes this a knife that one must use correct all the time for the safety. It is fully possible to use them in reverse. In general with SAKs it is the size of the construction that decides the use and if they have locking mechanisms. I have put serrations on blades before that are more simple. It was a nice experiement for me to learn more when the pattern is more intelligent, well so to speak in a way because it depends on the philosophy of use anyhow. I took notice of Mr Veff talk about avoiding snag so i deceided to tro to make the pattern able to avoid this. I managed to get some small scratches on the blade but that i can remove if i want. It is always interesting to such things free hand. The blades are slim and they are permanetly riveted so to get the blade free one would have to re pin and rivet the complete construction again.